Thursday morning [July 26] marked 37 weeks of my pregnancy. I woke up feeling a little “off” with a scratchy throat and a headache. I had been having pretty uncomfortable Braxton Hicks cramps on and off throughout the night, so was also very tired. I decided to stay home that day. As Dan was leaving for work, he could tell I wasn’t feeling well and even asked if I needed him to stay home with me, but I assured him that I could work from home a little as necessary and that I would be fine. I did get some work done, but couldn’t pull off a full day at the computer, and ended up spending most of my day on the couch either on the phone, sleeping or watching archived episodes of How I Met Your Mother on Netflix. We bailed on our plans for that night. I didn’t even get dressed that day. I was also very emotional. I took a bath in the afternoon and burst into tears when I realized that my giant pregnant body could not fully submerge in our tiny (read: normal-sized) bathtub. The water offered me no relief from my stomach cramps, which at this point in time were coming randomly probably about every 10-40 minutes. I called Dan from the bathtub to tell him all about it but could barely get words out. Then I spent about twenty minutes just petting our dogs, who stayed by my side all day long sensing that something was wrong. It was a very rough day, but never once did I think that I could be in labor. Dan got home from work around 4:30pm, and just having him home with me made me feel a million times better. We had been looking forward to going to The Lang Gang’s house for ‘Pizza Friday’ and to watch the 2012 Summer Olympics Opening Ceremonies. We decided that a change of scenery would be good for me and headed on over there around 5:30pm. I settled in to a comfortable corner of the Langs’ big red couch. Whenever I would have a stomach cramp, I would just close my eyes and practice the mental relaxation and breathing we learned in our Bradley Method classes. Dan sat next to me and held me and stroked my arms and employed a very quiet, discreet version of the coaching methods he learned in our Bradley classes to get me through the “cramps”. About when Bradley Wiggins rang the bell in Olympic Stadium, I whispered to Dan “You know, my cramps are coming a lot more frequently than they were earlier today, maybe you should use that Labor App to start timing them, JUST IN CASE they are actually contractions.” He reluctantly obliged. Over the next four hours, I labored and Daniel timed my contractions on his iPhone, right there on the Langs’ couch. I was very concerned about being inconspicuous in the presence of all my in-laws. I didn’t want to incite any questions about my present condition, but in hindsight they could all totally tell something was going on. I was starting to think that maybe I was in labor, but this seemed so unlikely. On the walk home, I decided I wanted to call our doula for a second opinion. When I was unable to reach her, I took that as a sign that I wasn’t in labor. Just really intense Braxton Hicks. I had read stories about women going into “false labor” multiple times before being in real labor, so I figured this was a really intense case of false labor. We walked home around 10pm, when my “cramps” were about 5 to 5 ½ minutes apart. Then we went straight to bed. My mind wasn’t racing, I wasn’t excited, I was committed to getting some rest. But my contractions were just incessantly waking me up every five minutes. Dan tried to be a trooper and continue to time them and coach me through them, but he kept dozing off so I started timing them myself. It was hopeless. I couldn’t function… half exhaustion, half pain, half confusion, half frustration. Or something like that. 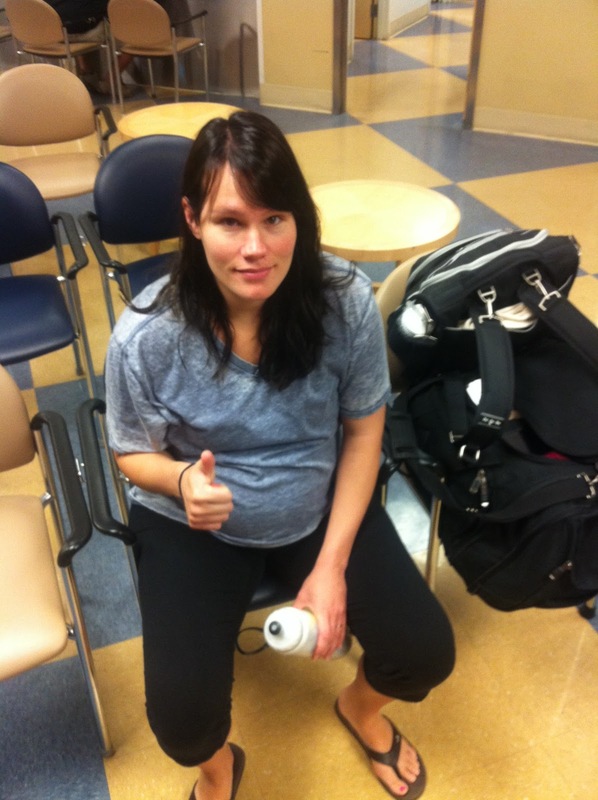 We learned in our Bradley classes that if you change activities during your contractions, (i.e. going from laying down to moving around, or vice versa) the contractions will go away if they are just BH, but in real labor they will stay on pace regardless of your activity. At midnight, I asked Daniel to get out of bed and walk around the entire house with me. We walked in circles around the kitchen, then downstairs and all through our newly painted basement. Luna and Apollo were so confused. Two confused pups in the middle of the night. It was during this time that all those Labor Rehearsals we did in class really paid off. Daniel knew exactly how to talk me through each contraction, I knew what positions to find and how to breathe whenever one would come along, no matter where I was in the house. Contractions didn’t go away. Now I was more and more convinced that this was it. I ate half a banana and a yogurt, and we went back to bed. At 2am, Daniel suggested that I take a shower to see if it made me feel better, and to afford him a solid chunk of sleep (if I really was in labor, he was going to need some rest on the front end to be able to make it for the long haul). The shower helped lessen the intensity of the contractions but did not reduce their frequency. I counted 14 contractions during my 45 minute shower. Dan got a solid hour of sleep. I got back in bed between 3am and 4am, dozed off some, and timed some more contractions. There was definitely a pattern and they were getting closer together -- There was no denying that fact. BUT… for the most part, we STILL thought this was false labor because I was so early. We weren’t ready. We still had three weeks. Every single person in our families had been born on-time or late. I had no medical indication of being at risk for anything that was to come. At about 4:30am we decided that since my contractions were 3-4 minutes apart, I should probably go on in to the hospital to get checked. We turned on the light in our room, threw random last minute things into our respective “Go” bags, filled up the dogs’ water, putzed around with some other things, and were ready to depart. Daniel had the genius idea to quickly load and start the dishwasher right before we left, so no matter how long we were gone, we wouldn't come home to a smelly kitchen. I will never forget saying goodbye to Luna and Apollo at 4:41am. I caught a fleeting glimpse of the real possibility that next time we saw them, there was a teensie weensie chance we would have a baby with us, and life as they knew it would be over. But that quickly went away as we got in the 4Runner to head to Mercy Gilbert. Most bi-polar car ride of my life. Daniel called my doctor and quickly filled him in on the pattern of my contractions and our arrival at the hospital, said that there was a chance we’d need him in a few hours. Doc affirmed our decision and said he would wait to hear if I was in active labor. The process to check in at the ER was painless and quick and before I knew it, I was in a wheelchair being pushed by a nurse to the third floor for OB triage. Dan walked next to us carrying two big duffle bags and a diaper bag. Super Husband. This was all just a fire drill to us. We knew we were doing the right thing going by-the-books and coming in to the hospital, but we were thinking they would check me, send me home and we’d have a baby in three weeks. So of course, we didn't call anyone. The exam that revealed that I was 4 centimeters dilated and 80% effaced was the most physically painful moment of my pregnancy and labor. Being "checked" was worse than any contraction I had. But a real scare came after that when they put the fetal heart rate monitor on my belly. Baby’s heart rate was great… until I had a contraction and it plummeted to 60 bpm (which means not enough oxygen to the brain). The nurse, alarmed, told me I needed to roll onto my other side, maybe there was something going on with the umbilical cord, regardless, baby “wasn’t happy” in that position. All My Nightmares at Once. I don’t remember many of the details of the next twenty minutes of my labor, but I do know that my doctor arrived at the hospital in what seemed like 2 minutes. I was so relieved to see him and not some on-call doctor who I didn’t know. MY doctor who knows me and Dan and our birth plan and our wishes for a natural experience, a friendly face who I trusted with mine and my baby’s life. Contractions were stronger. Beeping noises. Oxygen mask on my face. Stuff wrapped around my belly. Another vaginal exam. “Yep, just four centimeters.” Contraction. Four hustling nurses. Uber tight blood pressure cuff. Dan holding my hand. I was in a scene in an Aronofsky film. Contraction. Bright lights. They were waiting to see if baby’s heart rate was getting any better, but with every contraction, it plunged into a range that no one in the room was comfortable with. Contraction. Reassuring smiling faces masking concern and information they didn’t want to burden me with yet. Contraction. Blood pressure cuff. Contraction. Dan stroking my head. Contraction. Had we not taken the classes we took, learned the things we learned, and already had so much dialogue with my doctor as we developed our birth plan, I might have questioned him or even protested when he said a C Section was necessary. My whole pregnancy we were planning for an intervention-free birth… but we also were prepared for anything else that might come our way. This was in the latter category. If our baby was under this much distress when I was having contractions at only 4 centimeters, there was a huge likelihood she wouldn’t make it through the rest of labor, let alone a vaginal delivery. “…Baby needs to come out now” was followed by words words words I can’t remember. Between tears and contractions I just told doc “I trust you” and asked him to pray over me. Before my husband and I had to separate for a little while, I told him to call my mom and his sister and tell them to come, and to call Justin to ask him to commence the dog sitting activities. No one even knew I was in labor. Before I knew it, not even an hour from when we had arrived at the hospital, I was on my way to the operating room. That surgery was the worst experience of my life. Yes, you can feel it. Words cannot describe the physical discomfort of being awake while your organs are being jostled around by people in a big hurry to cut out a small watermelon, all while fearing that your baby has brain damage… or worse. I had to go deeper into a place of mental toughness and trusting God than I ever thought possible. I will spare you all the play-by-play, but I will say that I feel like I had to employ the same level of mental relaxation and pain management tools during my C section as I would have if I had gone through Transition and Phase 2 of a natural birth. It was awful. I remember hearing her cry. That was at 6:31am. I remember being able to discern from the chatter in the room that she was turning pink quickly, and feeling relieved. I think they brought her around the curtain and showed her to me before going to clean her up but I was so out of it that I don’t really remember what she looked like. I know Daniel was right there by my face holding my hand telling me how great I was doing. At one point I guess I told him to stop talking and those in the room thought it was funny, but I don’t recall saying that. I wasn’t sure if she was a girl, I feel like I kept desperately asking “Is it a girl? Is it a girl?” repeatedly but no one answered me. Daniel insists that he kept answering me “Yes, it’s a girl!” but I must not have heard him. Our little girl scored a 9 on her first Apgar and weighed in at a tiny 5 pounds 7 ounces. Not quite early enough to be considered a “preemie” but certainly small enough and fragile enough. I had to stay on the operating table for what felt like an eternity to be closed up, but Daniel was able to go with her to bathe and wave at Grammie and Gramps and Nana and Auntie Christina from the other side of the wall. In the post-op room, I had a very nice nurse who talked me through my disorientation and calmed the frenzy in my heart as she tended to my medical needs. Coming off the epidural, my toes were starting to wake up but I still couldn’t feel anything above my knees. I couldn’t wait to hold my little miracle. I still wasn’t sure I had confirmation if it was a boy or a girl, despite being told multiple times that she was indeed a girl (which we have known since March of this year, I was just THAT disoriented). I wanted to see her. 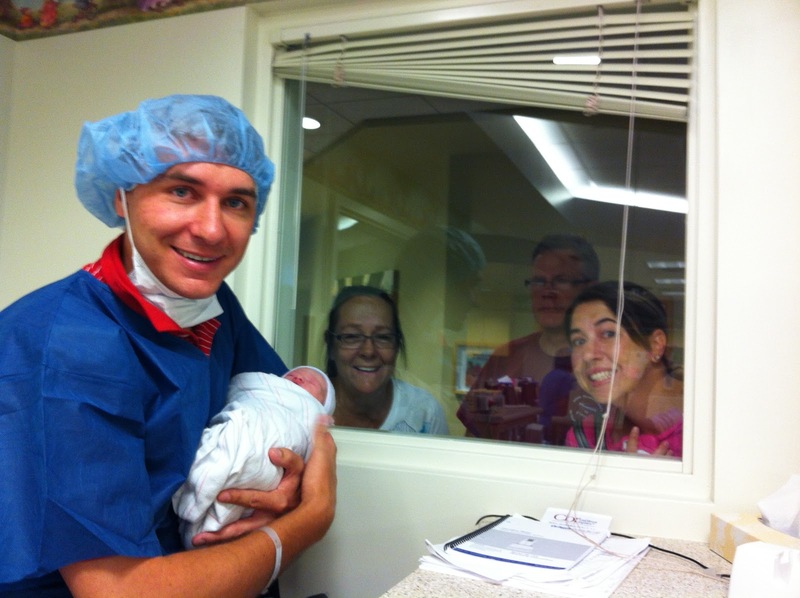 A few minutes later, my husband was able to bring my tiny daughter to me and we had our first moments as a family. Our naked daughter lay on my bare chest and started to nurse. Above my waning anesthesia, physical discomfort and the shock of it all… in this moment all I felt was love. Over the next four days, by the grace of God and with the help of an amazing nursing staff, I began to recover from surgery and Penny Jane proved to be one resilient little kid. We had a quick run-in with Penny’s blood sugar (for those of you familiar with these sorts of things, it was fluctuating between 23 and 40 initially) but she normalized to healthy glucose levels after 24 hours. The remainder of our hospital stay was more about me healing, our baby is tiny but healthy as could be. We were discharged on Tuesday to be reunited with our home and our dogs and start our life as a new little family. Going home on Tuesday afternoon, July 31st. At least once a day for the last five days, Dan and I look at each other and marvel at the fact that our baby is here. My due date was smack dab in the middle of August, so NEVER did we think she would be born in any other month besides August. We even purchased an August Birth Stone piece of jewelry back in May. NEVER did we think when we left for the hospital that morning that our daughter would be out of my womb within an hour and a half. Never did I think I wouldn’t give birth to her in a natural way. Never did Dan think he would have to change all the poopy diapers for the first three days because his wife would be recovering from major abdominal surgery. 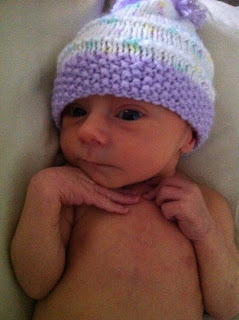 …NEVER could we have imagined how precious and perfect she would be and how much we could love her. I guess this little exercise of not being in control was a good kick-start to parenting. You can prepare but not always predict. We have no regrets about any decision that we made at any point throughout my pregnancy. We will never know why I went into labor so early, why she wanted out so soon. We also will never know exactly what was causing her heart rate to drop to such a low rate when my uterus was contracting, although the speculation is that perhaps there was a kink in the umbilical cord or a problem with nutrients coming through the placenta (which would have been an ongoing issue in my pregnancy, causing her to be SO small, even for 37 weeks). We will never know what would have happened if we hadn’t gone to the hospital when we did, or if we had gone to the hospital sooner. We will just never know. So we just don’t think about it. We think about our beautiful baby girl and how delighted we are to have her here. We think about how thankful we are for our health, our families and supportive friends, and skilled medical professionals. We think about all the fun milestones we have to look forward to. More to come from Mommy Griffin. 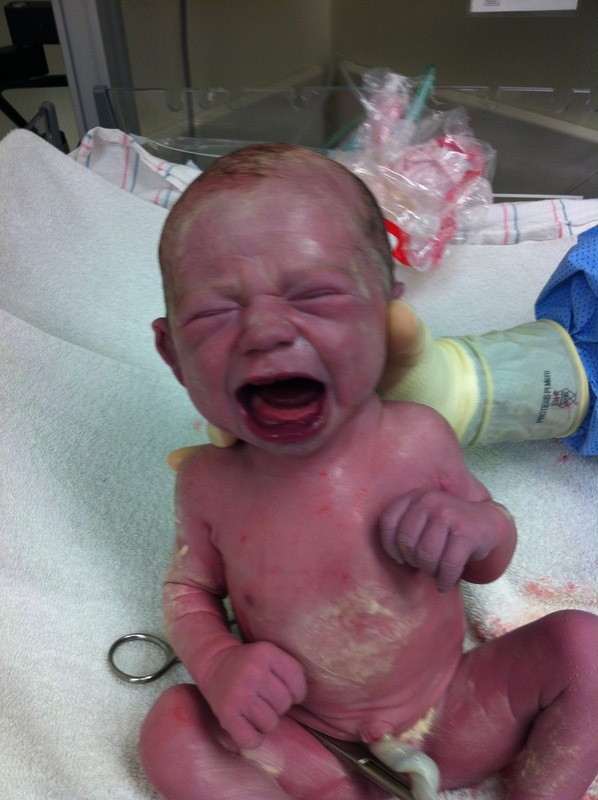 This auntie cried & laughed & felt the gush all over again at the miracle of birth!! Thanks 4 telling your story; wish Dan would in his gifted way. She is such a beautiful gift from God. I love the verse in Psalms: "Children are a gift of God. The fruit of the womb is His reward" Psa. 27 Blessings on your new Family! I loved reading your birth story. I've had 3 c-sections now so I know how you feel. One thing that helped with my recovery this last time was a postpartum support belt. Congratulations to you both, Penelope is gorgeous! So hard having a c-section when so wanted a natural birth - I really felt I'd missed out but like you just don't question it with heart rate falling.